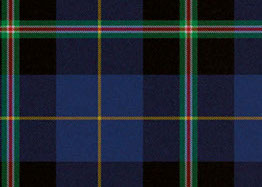 The Italian National Tartan was carefully created to represent the strength and pride of the Italian people. Each colour is significant to the Italian heritage to embody the culture, traditions, and history of Italians worldwide.The green, white, and red reflect the colours in the Italian flag, The tri-colours were adopted in honour of the uniforms worn by the Civic Militia of Milan which were predominantly green with some white. Red parts were added in 1796 when the Militia became the National Guard. The black in the Italian National Tartan reflects the Praetorian Guard, an elite force of palace guards established in the beginning of the Empire period, to guard the person and family of the Emperor. With its unique history, the guard still remains a symbol of strength and power.The gold represents the rich culture of the Roman Empire and the warmth and beauty of the Italian sunshine.These colours rest on a field of azzuro blue. The colour itself is bold and formidable, bringing forth images of the Mediterranean depths. It was selected in honour of the Italian National football team and embodies the love and support the Italian people have for their country.